There’s no denying it. Comic books and science fiction have more than their fair share of “only for geeks.” While I would be hard pressed to deny who I am, I will say that my love for science fiction goes far beyond just pure escapism. I’m one of those people that believes that there was some kid back in the 1960s watching Star Trek, and he kept seeing Captain Kirk pull out this communicator and flip it open – and that kid grew up and became an engineer, a designer of products, and we now have a device that is more common than the toaster. How many flip phones do you see on a daily basis? That which we imagine is what we tend to manifest in third dimension – that’s what human beings do, we are manifesting machines. The metaphor of a man who has an external electronic device, something man-made that serves him and somehow serves humanity, and that he becomes so aligned with that device, with the power of that device, that at one point he can discard it – I think that’s a real metaphor for the human journey. One day we won’t need a transporter device to get from one place to another. And it begins with the wheel and then migrates through airplanes to some future technology that we can’t produce yet but we can imagine. Imagination is really the key part of the human journey, it’s the key to the process of manifesting what our heart’s desire is. When I was a kid, it was comic books that pointed me in that direction and from comic books I went to science fiction literature, which is still one of my most favorite genres of literature to read. Don’t underestimate the power of comics and what they represent for us and how they inform us on the journey of being human – because it’s powerful. It’s very powerful. They give us permission to contemplate what’s possible. And in this world, in this universe, there’s nothing that is not possible. If you can dream it, you can do it. When I was a kid, I read a lot of science fiction books and it was rare for me to see heroes of color in the pages of those novels. Gene Roddenberry had a vision of the future, and Star Trek was one that said to me, as a kid growing up in Sacramento, California, “When the future comes, there’s a place for you.” I’ve said this many times, and Whoopi (Goldberg) feels the same way – seeing Nichelle Nichols on the bridge of the Enterprise meant that we are a part of the future. 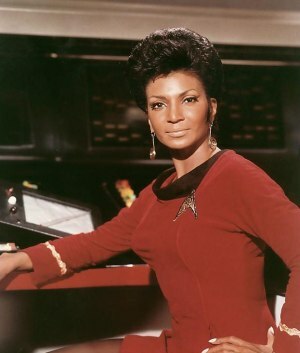 So I was a huge fan of the original series and to have grown up and become of that mythos, a part of that family, and to represent people dealing with physical challenges, much like what Nichelle Nichols represented for people like Whoopi and myself, I can’t even begin to share with you what that means to me. While I was fortunate enough to be born in an era where nobody questions the role of Asian-Americans in industry and science, I can also see why many Asian-Americans would have been similarly inspired by George Takei’s role as Sulu in the original Star Trek series.